“Our farm revenues have increased 10 times with the change in crops and farming practices. Till 1995 in our farm traditional crops were cultivated using chemical agri inputs but along with my younger brother, Vikrant I stepped out of the comfort zone and took the risk to turn our farmland into an organic fruit orchard. Additionally instead of keeping it as one crop orchard we decided to grow different varieties of fruits with the aim to have consistent cash inflow every month. We started with bael fruit in 1995 followed by sweet lime, kinnow and lemon in subsequent years. The results attained were extremely encouraging therefore in 2013 we added pomegranate crop in our orchard. It certainly is a profitable crop. Additionally on the insistence of visitor-farmers we also started a nursery to develop and supply orchard plants. It contributes fairly in annual farm revenues,” shares Mr. Rajnish Lamba, progressive farmer and co-founder, Hardev Baag and Udhyan Nursery. Hardev Baag and Udhyan Nursery, located at Chelasi village, Jhunjhunu district, Rajasthan is renowned for its superior quality fruits and nursery plants. 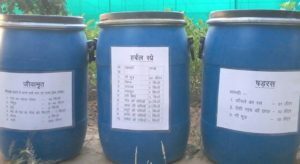 Entire farm is nurtured with agri-inputs prepared within the farm premises precisely vermicompost and cow-based manure and bio-pesticide. “We always want to give nutrient rich food to our family members then how can we sell inferior quality (chemically produced) fruits to consumers? Moreover, we were extremely concerned about the health of the soil therefore we decided that even though if we have to bear the losses we will not use any chemicals in our farm. The conviction paid off well and we are getting satisfactory quantity and quality of fruits. Our farm is 100% sustainable with organic farming practices,” affirms Mr. Vikrant Lamba, Co-founder. 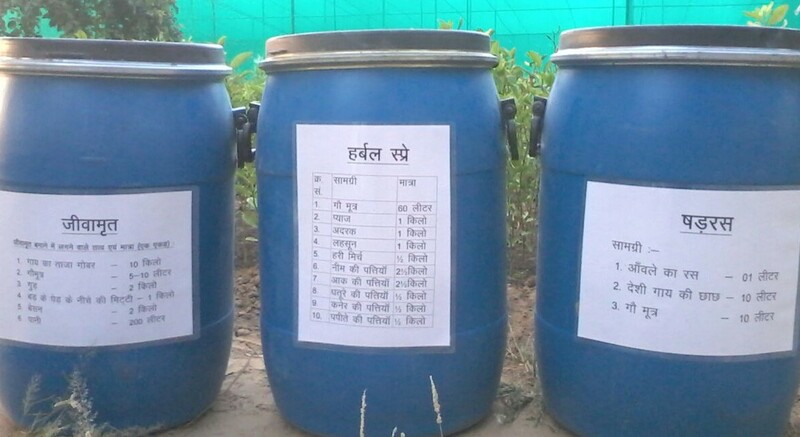 Bio-agri inputs are produced using neem leaves, dhatura (Angel’s Trumpets), cow dung and cow urine. “We have a small dairy unit of 5-7 cows that doesn’t suffice the requirement of manure for the whole orchard so we source 60-70 trolleys of cow dung from neighboring dairy farms. We also have a vermicompost unit within the farm where all the farm waste is decomposed and turned into manure,” he says. To keep the trees safe from pest and disease attack light traps are used, herbal solution is sprayed once in 15 days after flowering and smoking (burning neem leaves) in done in the evening. “As we do not use any chemicals in the farm the shelf life of our fruits is much more than conventionally cultivated fruits. Cow based farming inputs are complete food for the soil and plants. It must be topped with vermicompost then the nutrition to the soil and plants is assured,” he asserts. 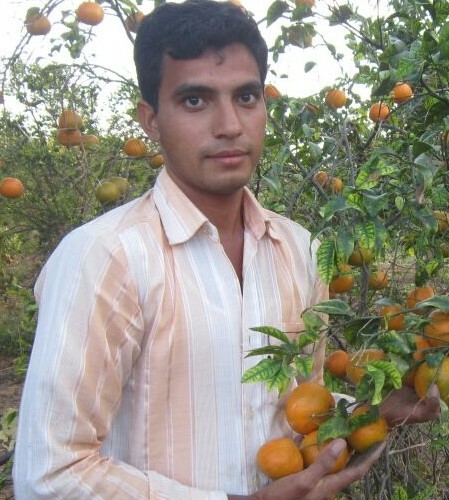 In the beginning Lamba brothers started lean with only half acre cultivation with bael fruit. They restored the soil fertility with cow based manure. Having received good sales they slowly and gradually expanded to other fruits. “We grew lemon in the farm boundary while rest of the farm had different rows of sweet lime, kinnow and bael. We have 500 lemon, 1500 sweet lime, 650 bael and 200 kinnow trees,” informs Mr. Rajnish. Three acre has mixed trees of lemon, sweet lime, bael and kinnow while pomegranate is grown exclusively in one acre. “As we were able to earn Rs. 4-5 lakh/acre so we decided to diversify in pomegranate cultivation in 2013. In one acre 600 Sindhuri pomegranate plants were transplanted. These were sourced from Nashik, Maharashtra. In 2016 we got the first harvest. 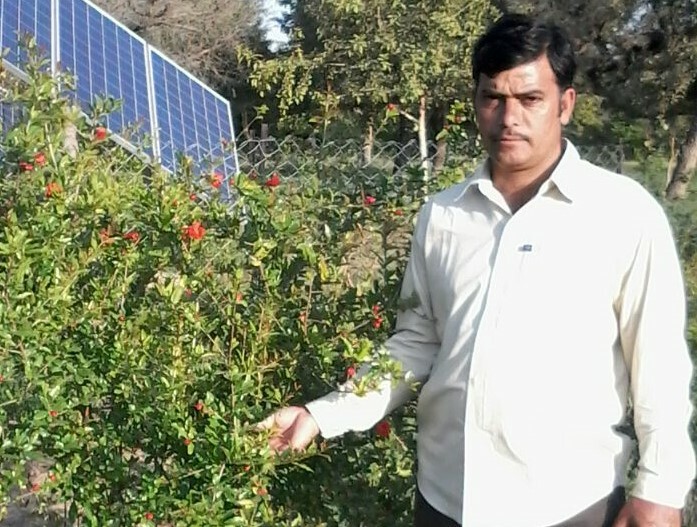 It was satisfactory and this year we are expecting more yield per plant,” says Mr. Vikrant. It is possible to take three harvests every year but at Hardev Baag only two times pomegranate is harvested precisely July-August and November-December. “As we don’t take the third harvest the plant health is restored and we get good quality fruits in next cycle.” Sindhuri pomegranate is more popular in Rajasthan than Bhagwa pomegranate as the former suits the weather conditions of the state. Every year many farmers visit Hardev Baag to observe the orchard and intent to replicate the same farming model. “Majority of them used to ask for the saplings of our fruit trees. Convinced that demand of saplings exists we extended our operations to nursery. With Vikrant’s technical knowledge we began preparing and selling grafted plants to the farmers,” states Mr. Rajnish on establishing Udhyan Nursery. 100-150 varieties of fruits and ornamental plants are supplied at the nursery. Pomegranate, lemon, bael, sweet lime and kinnow plants are grafted in-house rest of the saplings are sourced from other nursery and re-sold. Udhyan Nursery is approved by Rajasthan state government for its quality of saplings. Annually 30-40 thousand saplings are sold. Irrigation is done with drip system operated using the solar power. “Although expensive yet we have installed two solar plants, 5 HP and 3 HP as we want to be independent in our operations. We are extremely particular about our irrigation schedule so with solar power it is on-time always. We received the subsidy from government so it was helpful,” he highlights. Entire farm produce is sold within Rajasthan in wholesale markets. “We have the option to sell in the mandi or even traders are ready to come to our farm gate for the purchase. However we prefer to harvest, grade and pack the fruits then sell in the wholesale market because we are able to get higher price for our neatly packed fruits,” he affirms. Except January-February either one the fruit is harvested all 10 months thus the orchard has a stable income. In time to come Lamba brother looking for expansion of their orchard, “This July, we shall be planting 1000 new saplings of lemon. 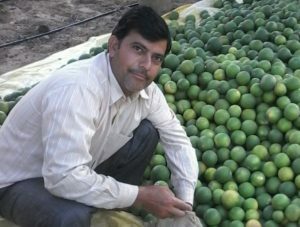 We have observed price of lemon is consistent and appreciates remarkably during summers so we want to tap this demand. We have improved our old lemon trees by grafting and in the process we have developed a new lemon variety ourselves in which the yield will be almost double, the fruit shall have higher juice content and it’s skin will be thin,” reveals Mr. Rajnish. In addition they shall be taking a new land on lease for developing a new orchard.